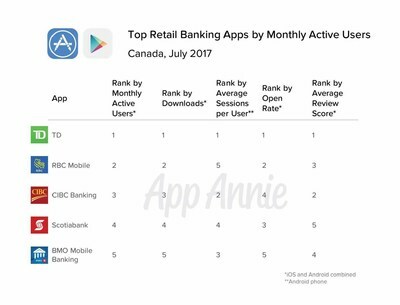 TORONTO, Sept. 14, 2017 /CNW/ - A new report on retail banking apps released today by San Francisco-based firm App Annie, indicates an increasing number of Canadians are spending more time using mobile banking apps for their branch banking needs. App Annie's metrics are specific to the mobile app industry. They leverage diverse data sets from app stores, publishers, advertisers and end users and apply advanced statistical modeling and machine learning to develop detailed app-level metrics for companies to maximize the impact of apps on their business. "Mobile continues to be our top channel for customer transactions, so we are very pleased that our commitment to delivering best-in-class mobile banking services is recognized," says Rizwan Khalfan, Executive Vice President and Chief Digital and Payments Officer at TD. "We're thrilled to be ranked so highly on metrics that directly reflect what's driving value for our customers. It's great validation - and feedback - as we continue to focus on building experiences that enable our customers to bank when, where and how they want." "Undoubtedly, mobile apps are a disruptive force in banking, but they also present a significant opportunity for established banks with a large retail or branch presence," said Bertrand Schmitt, CEO and Co-Founder, App Annie. "Thanks to mobile, users are more engaged with their banks and feel more empowered when it comes to their finances than ever before. Traditional retail banks must be prepared to take charge with comprehensive app strategies and the data to back them up." TD demonstrates its ongoing commitment to providing Canadians with modern and innovative banking services by growing TD's mobile banking app features and offerings, including the TD My Spend App that features instant notifications, spending insights and category tracking to give users greater insights into their spending.